and the Dedham Family Fun Run! Charlesbridge Publishing, Harper Collins, Abrams, Scholastic or Candlewick Press. Help us support Cradles to Crayons: Bring new kids' socks with you to donate for low-income and homeless kids! *Books available while supplies last. 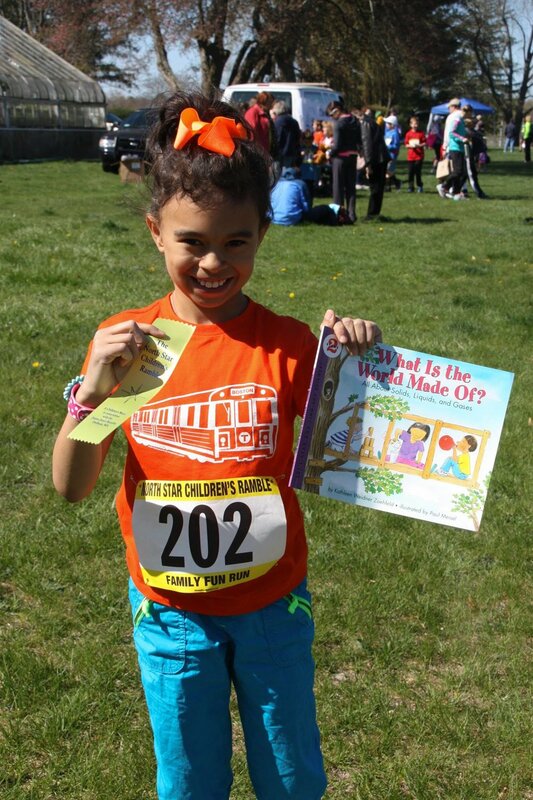 The North Star Children's Ramble is a one-of-a-kind literacy-themed sporting event for kids ages 4-12 and their families. There are age-specific races ranging from the 50 yard dash to 500 yard dash, and The Dedham Family Fun Run. If you have kids that would like a longer course challenge, The Dedham Family Fun Run is for them and their family members. Kids can run the entire course solo, with family members, or do a family relay where the course is divided between family members. Special consideration will be given to families with creative matching uniforms. The North Star Children's Ramble event also includes coloring activities for runners and non-runner audience participants. Like its "parent race," James Joyce Ramble, the North Star Ramble creatively mixes sports and the arts together by tying in Dedham author Peter H. Reynolds’ book, The North Star. Registration forms will be available at The Blue Bunny Bookstore in Dedham Square. LOOKING TO SAVE TIME? - Print and fill out Registration form in advance! PHOTO FINISH: The Children’s Ramble organizers will be posting public photos to our Children’s Ramble Fan Page Facebook album for sharing. Please like our Facebook Page for photo links and updates after the race. The Children's Ramble is on the opposite corner of the Endicott Estate, please find us at the corner of Mt. Vernon and Walnut, near the greenhouse. For a peaceful day, the entire James Joyce race day (children and adult events) will be secured by law enforcement personnel. The "parent race" for this event - the 10K James Joyce Ramble - celebrates art, literature and athletics. For more information about the race check out www.ramble.org or call the Dedham Youth Commission at (781) 751-9190. The children's event has been named for nationally-acclaimed author/illustrator/educator Peter H. Reynolds' book The North Star. For more inspiration on the journey, visit Children’s Ramble sponsor The Blue Bunny Bookstore in Dedham Square. Check the North Star Children's Ramble coloring page designed by Peter H. Reynolds so you can bring an already personalized copy to the event. For photographs, articles and up to date news on this year’s event, like us on Facebook. And finally, do you want to make your race experience complete? Print out the Reynolds Center approved certificate to show everyone what you accomplished on April 28th.